Sheena Crouch has been wowing audiences with her portrayal of Dusty, playing to packed houses around Australia and internationally - but now it's time to get up close and personal! In this exclusive pre-Christmas season, 'Dusty' waltzes into town for three shows only at the wonderful new venue - Downstairs @ Alma's. This intimate production showcases all Dusty's biggest hits, I Only Want To Be With You, I Just Don't Know What To Do With Myself, You Don't Have To Say You Love Me, Son Of A Preacher man, Little By little, Wishin' And Hopin', Look Of Love, Stay Awhile and many more. 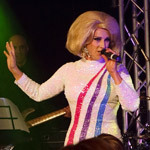 Bringing to life the sound and soul that was Dusty Springfield! Having recently finished a national tour with Australian Rock legend Marty Rhone. Cliff & Dusty Together At last. Performing to a sold out house at the Crown Casino, Palms Showroom. Sheena is very excited to be returning to Melbourne in this intimate setting. Dusty took the very best of British pop and mixed it with her appreciation of American Soul. Producing a career that spanned every musical genre and endeared her to millions of fan worldwide. 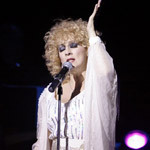 The queen of the big ballad and toe tapping tunes Dusty imbued every song she sang with her own unique trademarks-the hair, the makeup, the costumes and the rich, deep voice laced with soul. But above all her strength and musical vision made her a true Diva before the modern day Diva's where even born. 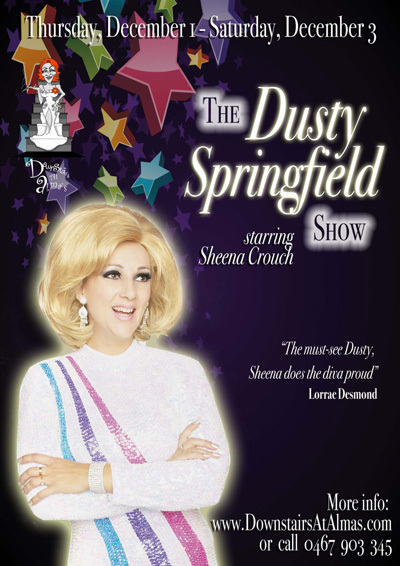 "The must see Dusty, Sheena does the diva proud!" "If you missed the real Dusty live, don't worry. Sheena Crouch as Dusty transports you back to the Dusty era and has you feeling like Sheena and Dusty are one. 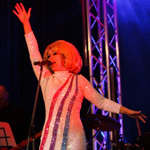 A truly fabulous show that will have you dancing and singing back into the 60s and 70s in your seat!" "A magical voice which transported the audience to another place and time... mesmerising!" "If Dusty came back to earth, she'd be flattered. Sheena does her proud." "We were mesmerised by your show and became entrapped for 2 hours in a time capsule of Dusty's Era. We were also hearing comments from the Audience that 'Dusty had a very good voice but Sheena has an even better one'. Congratulations to you, the back up singer and the band for a very entertaining evening. Definitely worth seeing for all Dusty fans."